BlackBerry today announced the Z30 smartphone with a 5-in. display and a larger battery for 25 hours of mixed usage. A BlackBerry spokeswoman said U.S. carriers will announce pricing and availability soon, while a rollout in the UK and Middle East will begin next week. A company statement said nothing more than that the U.S. release would be during "the holiday season." The announcement comes just two days before Apple and wireless carrier partners begin sales of the new iPhone 5s and iPhone 5c. Also, recent reports indicate that parts of the BlackBerry business could be sold -- although without the smartphone division -- potentially leaving support for Z30 buyers in limbo. In response to concerns about Z30 support, BlackBerry said it would work with its carriers and retailers to "ensure our BlackBerry customers receive the best experience possible." The Z30's 2880 mAh battery is the largest ever for a BlackBerry smartphone. The phone benefits from battery enhancements in an update of the OS to BlackBerry 10.2 and offers 25 hours of mixed use, which includes up to 18 hours of talk time. BlackBerry advised that actual battery results may vary. The 10.2 refinements include a new BlackBerry Priority Hub that provides one place to manage conversations and notifications. Also, BlackBerry Messenger has been refined to offer a preview of any message when it arrives in whatever app is being used. The 10.2 version will be available to the already-released Z10, Q10 and Q5 smartphones in mid-October, subject to carrier approvals. BlackBerry said the Z30 also has new Paratek antenna technology to dynamically tune reception to give a better connection in low signal areas. The result, BlackBerry claimed, will be faster data transfer and fewer dropped calls in low signal areas, but the improvements weren't quantified. The 5-in. display is based on vivid Super AMOLED technology used in Samsung smartphones. The resolution is 1280 x 720 pixels with 295 pixels per inch. A 1.7 GHz Snapdragon S4 Pro processor is supported by a quad core Adreno 320 graphics processor. There is 2GB of RAM and 16 GB of internal storage and a microSD slot for expansion. An 8-megapixel rear camera and a 2-megapixel front camera are included. Wireless connections include 4G LTE with global roaming bands, near-field communications (NFC), Bluetooth 4.0 Low Energy and 802.11 a/b/g/n. The Z30 device has much of the same shape and contouring as the Z10, which comes with a smaller 4.2-in. display. The Z30 weighs nearly 6 ounces and is 5.5 x 2.8 x .37 inches in size. With those dimensions, the Z30 is slightly larger in every measure than the Z10 and just over an ounce heavier than the Z10's 4.8 ounces. 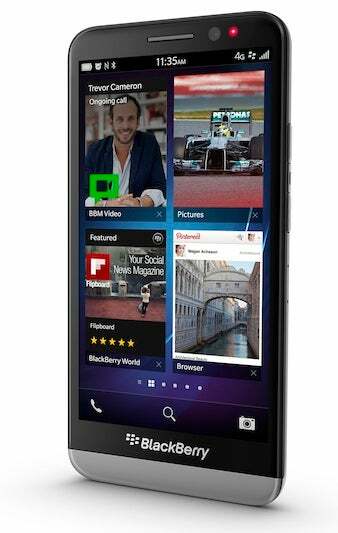 This article, BlackBerry announces Z30 smartphone with 5-in. display, large battery , was originally published at Computerworld.com.